Sabic’s polycarbonate (PC) glazing solutions were highlighted during Abarth’s official launch of the production model of its Abarth 695 Biposto. The vehicle’s front fixed windows, which include built-in sliding panels, are made from Sabic’s Lexan resin, a PC material, and Exatec coating technology. The fixed front windows with sliding panels are features straight from the world of racing and is applied to the Abarth 695 Biposto to help transfer the racing experience of the Abarth brand to the on-road car market. Only Sabic’s Exatec coating can make this possible because it is the one solution available in the industry today that meets European regulatory requirements for transparency, scratch and abrasion resistance for PC-based vehicle windows. 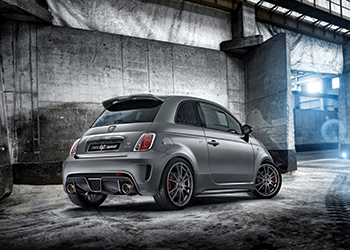 The Abarth 695 Biposto (which means "two-seater" in Italian) heralds back to the original super-fast Fiat Abarth from 1964 and is the road-going reinterpretation of the Abarth 695 Assetto Corse, which competes on racetracks throughout Europe. Isoclima, a supplier with twenty years of experience working with some of the racing world’s biggest teams, developed the sliding window concept and assembled the fully glazed windows. In addition to providing the glazing materials and technology, Sabic delivered support in the ideation and development phase of the project. "We wanted everything about the Abarth 695 Biposto to evoke a sense of racing excitement," says Maurizio Consalvo, Abarth’s head of product marketing. "That’s why we made sure to include the right number of racing-derived components in the car, including the PC-based fixed front windows with sliding panels, just like those in the race version. "However, to bring these lightweight windows from the race track to the road, we had to meet stricter performance requirements for glazing materials under European regulations. Fortunately, Sabic delivered to us the one industry solution available today that made this possible." That solution is Sabic’s proprietary Exatec glazing system. This approach involves applying protective coating layers on the Lexan resin-based windows. First, a hard coat is applied to the thermoplastic windows to ensure resistance to sunlight UV exposure. A glass-like plasma coating is then applied over the hard coat, which delivers an advanced level of protection for scratch and abrasion resistance. This not only enhances the weatherability of the hard coat layer, but delivers the performance necessary to meet regulatory standards. "It is rewarding for us at Sabic anytime one of our customers is able to achieve ambitions that would not otherwise be possible without our materials," says Scott Fallon, general manager, Automotive, Sabic’s Innovative Plastics business. "In this case, our Exatec coating technology proved vital to the task of creating a road-ready racing car without compromising the design. This vehicle is another in a line of good examples of what PC glazing can do to help automakers’ develop and deliver lighter, better performing and differentiated vehicles for their customers." Sabic’s PC glazing solutions makes possible up to 40 per cent in weight savings for the front fixed window and sliding panel compared to conventional glass. These savings adds to a number of other weight-reducing measures to help the Abarth 695 Biposto weigh in at just 997 kilogrammes. The weight loss adds to the sporting character of the car, boosting its performance. The car’s low weight combined with its 1.4 T-Jet engine tuned to 140 kW and 250 Nm has resulted in a small supercar that finishes first in its category with the best weight-to-power ratio (5.2 kg/HP) and the best acceleration (0-62 mph or 0-100 km/h in 5.9 seconds). The car can reach a top speed of 230 km/h (143 mph).